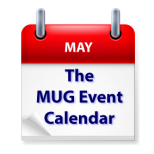 Social Media is at the top of this week’s MUG Event Calendar. One group will look at the various social media networks out there, and another will focus on Facebook. A Connecticut group will talk about drones, an Australian group will cover some of the top Mac utilities, and 1Password is the featured topic at a California group.